"You're not doing this for yourself. You are doing this for generations yet unborn." These words of encouragement, spoken directly to Melba Beals by Dr. Martin Luther King, became her mantra, her guiding light for the challenges yet to come. In 1957, Melba was a young African American student, craving a better education. She bravely volunteered to be one of the Little Rock Nine - a small group of African American students chosen to integrate Central High School in Little Rock, Arkansas. On the first day of school, the children were met by a mob fuelled by hatred and racism. Over the next few days, the eyes of the nation turned to Little Rock, and to the Little Rock Nine. The Little Rock integration brought Melba's face into the limelight, but this is just one chapter in this courageous woman's extraordinary journey. I Will Not Fear chronicles her life of challenges and the faith that carried her through it all. She bravely shares her stories of racism - not just the prejudice shown to her, but her own struggles in overcoming her fear of white people. Despite her rough years in high school, Melba was a passionate learner and earned several degrees. She built a career as an NBC television news reporter, a magazine writer, and a professor. As she narrates the story of her life, she is open and honest about her deep faith in God. Every chapter ends with a prayer or Scripture verse for inspiration. She shares the challenge of finding and trusting God, even in her darkest moments. 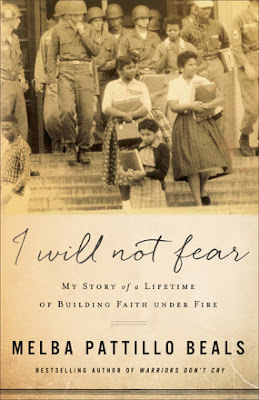 My one critique of I Will Not Fear is that it's actually too short! Melba has led a truly inspiring life, and it felt like many of the stories were told too quickly. I know she's written another memoir on her high school years (which I'm hoping to read next), but her adult life is also amazing. I wish she had spent more time telling these stories, and sharing those extraordinary experiences with each of us. I loved reading Melba's story and hearing her heart for God. I'm so moved by her courage, and I love that she has shared her faith in such an intelligent and heartfelt way. I wish we could say that the civil rights struggle was simply a chapter in history books, but every day, the news tells us otherwise. Our current North American society still struggles with racism and the ugly rise of white supremacy. More than ever, we need to hear stories like Melba's. We need to hear about the battles that have been fought if we're ever to understand the weight of the challenges ahead. And we need leaders who are willing to be honest about their faith, and the power it has in creating social change. God is always present with us, even "as close as your skin." I received this book to review from the Nuts About Books Blogger Program and Graf-Martin Communications Inc. I was not required to write a positive review. The opinions I have expressed are my own.